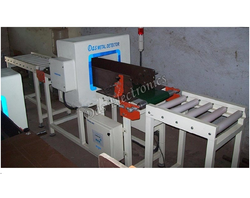 We are a leading Exporter of wood metal detector from Mumbai, India. Wood Metal Detector is used for detecting and eliminating metal contaminants in wood processing industries. We offer highly reliable Metal Detector For Wood that is fabricated using optimum grade stainless steel or mild steel. Our Metal Detector for Wood Industry features audio and visual indication on detection of metal. Pneumatic flap, Air jet, diverter arm, belt retracting and belt stop types of reject mechanism are available with the detector as per the requirement placed. Further, it is efficient in functioning on variable speed.